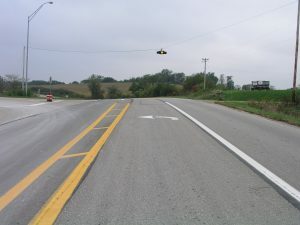 Channelization using a painted center island and left turn lane at a rural intersection in Iowa (Ryan Pettit/Institute for Transportation). Channelization adds painted, raised medians or islands that direct vehicles or pedestrians into specific movements. Turn lanes at intersections are mainly used to separate turning traffic from the through traffic. They also provide safety and reduce delay. Channelization adds painted, raised medians, or islands that direct vehicles or pedestrians into specific movements. Channelized islands are also sometimes used to place traffic control devices. The effectiveness of channelization is mainly available through studies at signalized intersections. Reductions from 4 to 79 percent have been reported depending on crash type. More information is provided in this technical brief, Adding Turn Lanes/Channelization (PDF), which summarizes information about channelization relevant to Iowa.